You cannot afford to be complacent in the event of a major accident. 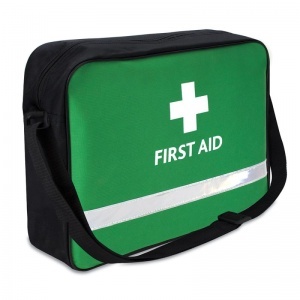 The Fast Response First Aid Kit in Marseilles Grab Bag is a comprehensive first aid kit designed for a larger workplace. No employers should be left unprepared should a member of staff, or even themselves, get seriously injured during the work day. This kit makes it possible to immediately attend to major injuries in the crucial moments before the emergency services arrive. The contents of the kit include two sizes of HSE dressings, for effective and versatile treatment. Additional account has also been taken into the risk of serious injury by incorporating thicker ambulance dressings and unique Maxiflex dressings in the impressive line-up of health and safety materials. What Items Are Included in the Grab Bag? 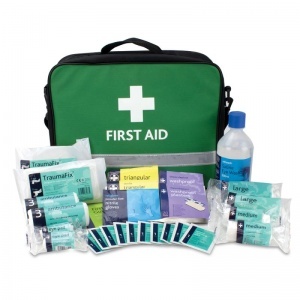 This kit is a lightweight grab bag that is ideal for first response first aid in an emergency. Marseilles-style, it is a simply designed shoulder bag with an additional carry handle, made to be uncomplicated and very functional. The Fast Response First Aid Kit in Marseilles Grab Bag is usually dispatched via First Class Royal Mail and delivery should be within 1 to 3 working days.